← Hispanicize 2016, here I come!! April was a very busy, very exciting month for us! So many wonderful things happened, and to be honest I was too busy living it to blog about it. Here’s a quick synopsis of everything that took place last month. As I mentioned in the post just below this one, I didn’t think I’d make it to Hispanicize 2016. It saddened me to think that I’d miss it, so I figured out a way to make it happen: I worked two full days, Tuesday and Thursday, and went to the event during the day on Monday, Wednesday and Friday. Among the highlights were the first ever DimeMedia Summit, and the official launch of The Laurit Spina Bifida Project, my dear friend’s wonderful labor of love (go check it out, and contribute to the cause, if you can. Thank you!!). Another highlight was attending a very special screening of Disney’s latest live action feature film The Jungle Book, one week before it opened in theaters! 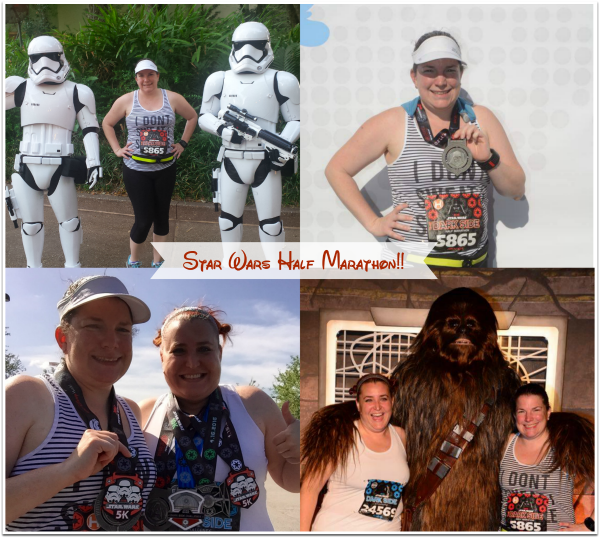 Just a week and a half later, and the main reason why I couldn’t take any additional time off during Hispanicize, was the Star Wars Dark Side Half Marathon Weekend at Disney World. We headed to Orlando for four days, got to hang out with my dear friend Rachel, visited all four parks, and I completed my 11th 10th (darn Wine & Dine 2016 Half of a Half keeps throwing off my count!) Half Marathon. Last but not least, Matty and I participated in his first Run Disney event, the Star Wars Dark Side 5K. He had an absolute blast running through Epcot and seeing all the character stops. He was a bit photophobic that day, so I don’t have very many pictures, but this is one of my favorites. Poor thing had a 4am wake-up call, so clearly by 8:15am was due for a nap, holding his medal in his sleep. April also had Eric and I revisiting our youth, as we attended concerts by both Pearl Jam and Bush. It was like listening to the soundtrack of our high school years. Pearl Jam was amazing, but I’d have to say the Bush concert was my favorite out of the two, if for no other reason than Gavin Rossdale went around the entire theater, section by section, during “Little Things”, and was just a few feet from us. That was a very cool experience!! Last but certainly not least, the month ended with a huge moment for our family: my little sister got engaged! Knowing how important it was for us, her family, to be a part of it, her fiancee planned a beach day at Bill Baggs State Park (also known to us Cuban folk as El Farito). She was so surprised when they arrived at the beach to see us all there, but little did she know what was in store as the day progressed. It was a joyous, emotional, wonderful moment for all of us, and I take all the credit: I introduced them last May! Let the wedding planning begin! This entry was posted in Disney, Entertain Me, Family & Friends, Fun Stuff, Health & Wellness, Life Happens, Movies, Run Manders Run. Bookmark the permalink.